We’ve covered the idea of having a ‘garden kitchen’ before: a kitchen space that has areas dedicated to growing plants and food central to its design; but in this blog we’re looking at a slightly different way of bringing the kitchen and the garden together. Where your kitchen adjoins your garden, or some kind of outdoor space, it’s a really nice idea to be able to create a flow between the two, blurring the demarcation and creating something that feels like a complete scheme rather than two distinct spaces. Having large glass doors directly from the kitchen into the garden not only gives you access to the garden but visually helps to combine the two areas – even when the doors are closed. uPVC French doors, bi-folding doors or even building the kitchen in a conservatory or orangery will help achieve this. In the summer you can throw open the doors and use it as one space. By having no breaks in the flooring style, it really will feel like one area. An obvious choice for this would be a wood floor. With real wood, laminate or a good quality wood effect floor tile such as Karndean in the kitchen and then decking into the garden, your eye will be taken through the whole area as one. Ensure you match up the direction of the planks and that both the kitchen and decking planks are the same width. It works best if both floors are the same level so you could build the decking up to achieve this if the house is higher than the outdoor space. Pick a theme and use it throughout both areas. Planting is the most obvious. Have some planting displays, in the same style of pot, in the kitchen and the garden – running from one into the other. Enamel ware or wood work well in a vintage style space or something metallic or crisp and white would look good in a modern scheme. If you have lots of glass such as with large glass doors or a conservatory, you could create a greenhouse type effect that brings both spaces together. You could also have a display that at first glance looks the same but at closer inspection is space-appropriate eg a continuous hanging feature that has cooking utensils in the kitchen section and then gardening tools outside. If you have an appropriate space why not place a table and chairs in the area right outside the kitchen. This will then feel like an outdoor dining area that can be used as such in good weather. You can definitely work this into your kitchen design. Run units down in the direction of the doors/windows that lead onto the garden to guide the eye along. Match kitchen door styles to outdoor units eg by using the same wood effects, by matching door colours to planters and using the same materials outside as used on counter tops and splashbacks (eg wood or decorative tiles). We have lots of ideas for this theme on our Indoor/Outdoor Kitchens Pinterest board so that’s really worth a look. 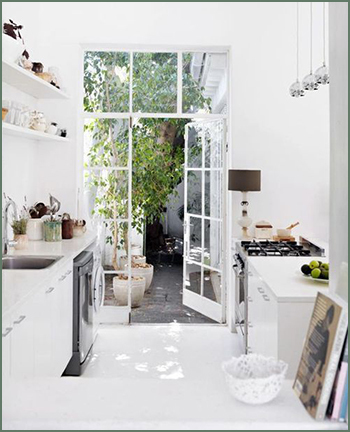 If we can help you plan a kitchen that incorporates indoor and outdoor themes (or of course any kind of kitchen!) then call us on 0800 321 3491 or send us a message. 0 Responses to "Bringing the garden into the kitchen"